This Vertical Pleated (tuck and roll) pattern solo seat is 9-1/2" wide by 13" long, a perfect fit for that lane-splitter your are building. These seats are USA made start-to-finish in Centerville, Indiana at Sully's Customs. Steel pan and hardware, with black powdercoated finish, 3/4" foam and a high-quality naugahyde cover. Sully's Customs builds high quality seats at a low price for the garage or backyard builder. 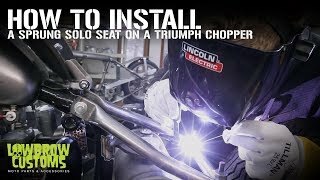 Out of necessity Sully 's Customs started building seats in 2011 to meet his needs that no other seat manufacturer could. Boom a seat business is born. Great seat, nicely made at and affordable price.